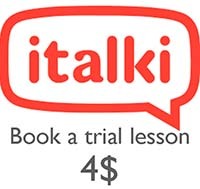 You will have the opportunity to interact with a native Italian teacher wherever you are and at a time suitable to you. All you need is a computer and an Internet connection to feel as if you are in the same room as your teacher. 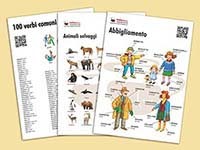 Collection of free printable worksheets covering Italian vocabulary. All of the worksheets are in PDF format for easy printing. But can you study on paper without renouncing the benefits of technology? This Grammar is a support for your Italian language studies. Don't be afraid of learning by heart! It is an excellent exercise for the brain and the heart! Collection of basic italian words, grouped into categories. If you are new to Italian and you’d like to jump in and play with the language, these series of basic words in Italian can be very useful.